PebbleBed heathlands of East Devon. The heathlands of East Devon comprise beds of rounded pebbles and a red sandstone matrix. They extend northwards towards the Somerset border and are up to 32 metres in thickness. They were deposited by a large northward flowing desert river which crossed this area during the early Triassic, some 235 million years ago. At that time southern Britain was almost in the centre of a large continental area and lay just north of the equator. The climate was hot, with the winds coming from the east across a wide expanse of desert sand, inland salt lakes and inhospitable uplands. The rivers dried up leaving the pebbles exposed to many years of wind erosion. Some of the characteristic purple quartzite pebbles were polished and coated in a "desert patina" while others were eroded into the characteristic "dreikanter" (three faced) pebbles, often found near Budleigh Salterton. Wind - blown sands eventually buried the river channels and these in turn were buried by the fluvial sands of the Otter Sandstone. In these sandstones are found the rare remains of Rhynchosaurs, ancient ancestors of the dinosaurs. Fossils of these small, plant - eating reptiles are occasionally found between Budleigh Salterton and Branscombe. Several specimens can be seen in the Royal Albert Memorial Museum in Exeter. To the east, near Poole Harbour, these same porous sandstones are now 3Km below the ground surface, where they are the reservoir for a part of Britain's largest on - shore oil field. Since their deposition in the Early Triassic, the Budleigh Salterton Pebblebeds have been deeply buried beneath the rocks of the Jurassic and the Cretaceous age. Earth movements during the Cenozoic (20 million years ago) have tilted the Earth's Crust and the erosion has now returned them to the surface. 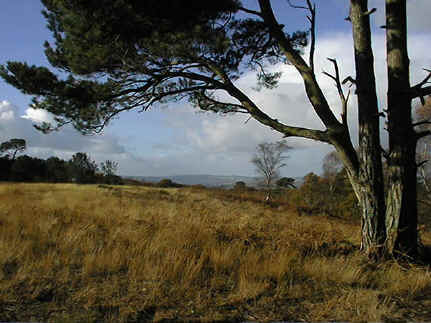 The Pebblebeds produce infertile acidic soils which support the valuable lowland heath habitat. The PebbleBeds also support recreational, military, quarrying and forestry uses. The highest part of the pebblebeds' scarp forms the watershed between the streams that drain west to the rivers Clyst and Exe and the streams that drain east to the river Otter. Pebbles known locally as "popples" have been used for the construction of walls, floors and occasionally whole buildings in local villages. The name "popple" has given itself to the nearby village of Newton Poppleford.